Himalayan balsam (Impatiens glandulifera) is a relative of the busy Lizzie, but reaches well over head height, and is a major weed problem, especially on riverbanks and waste land, but can also invade gardens. It grows rapidly and spreads quickly, smothering other vegetation as it goes. Introduced to the UK in 1839, Himalayan balsam is now a naturalised plant, found especially on riverbanks and in waste places where it has become a problem weed. Himalayan balsam tolerates low light levels and also shades out other vegetation, so gradually impoverishing habitats by killing off other plants. It is sometimes seen in gardens, either uninvited or grown deliberately, but care must be taken to ensure that it does not escape into the wild. The flowers are followed by seed pods that open explosively when ripe. Each plant can produce up to 800 seeds. These are dispersed widely as the ripe seedpods shoot their seeds up to 7m (22ft) away. Plants that out-compete other more desirable plants or simply invade half the garden are classed as weeds and require control. 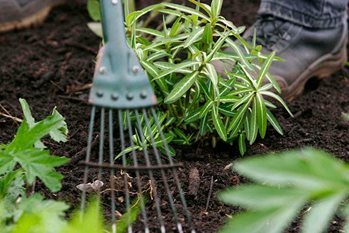 First, consider whether this can be done using non-chemical means such as pulling or digging out, or suppressing with mulch. If this can't be achieved, consider using chemical methods. The main method of non-chemical control, and usually the most appropriate, is pulling or cutting the plants before they flower and set seed. Conservation authorities regularly organise ‘balsam bashing’ work parties to clear the weed from marshland and riverbanks. Where non-chemical control methods are not feasible, chemical controls may need to be used. Choose a weedkiller that is most appropriate for the purpose by reading the label carefully before buying or using. Contact weedkillers and glyphosate have low persistence in the soil, being virtually inactivated on soil contact. Residual weedkillers persist in the soil for several weeks or months and can move deeper or sideways in the soil, leading to possible damage of underlying plant roots. Before using weedkillers alongside waterways it is necessary to contact the Environment Agency (see telephone directory for your local office). It can advise on suitably qualified contractors, as can the National Association of Agricultural and Amenity Contractors. Take care when applying weedkillers near ornamental plants. Cover them with plastic sheeting while spraying, and only remove it once the spray has dried on the weed foliage. It may take a couple of seasons to obtain good control of Himalayan balsam, as additional weed seedlings germinate after the parent plants are killed off. The non-selective contact weedkillers acetic acid (Weedol Fast Acting Gun!, Ecofective Weed Blast), fatty acids (SBM Solabiol Super Fast Weedkiller) or pelargonic acid (Doff 24/7 Fast Acting Weedkiller, Neudorff Weedfree Express, Westland Resolva Zero Weedkiller) can be applied before flowering. Himalayan balsam can be controlled with a weedkiller based on glyphosate (e.g. Roundup Fast Action, Westland Resolva Xtra Tough Weedkiller, SBM Job done General Purpose Weedkiller or Doff Maxi Strength Glyphosate Weedkiller). Glyphosate is a non-selective, systemic weedkiller that is applied to the foliage. It is inactivated on contact with the soil, so there is no risk of damage to the roots of nearby ornamentals, but care must be taken that the spray doesn't drift onto their foliage. Glyphosate is most effective when weed growth is vigorous. Treat Himalayan balsam at early flowering stage to ensure the weed is knocked back before it has chance to self-seed.